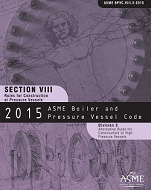 BPVC-VIII-3-2015 provides requirements applicable to the design, fabrication, inspection, testing, and certification of pressure vessels operating at either internal or external pressures generally above 10,000 psi. Such vessels may be fired or unfired. This pressure may be obtained from an external source, a process reaction, by the application of heat from a direct or indirect source, or any combination thereof. Division 3 rules cover vessels intended for a specific service and installed in a fixed location or relocated from work site to work site between pressurizations. The operation and maintenance control is retained during the useful life of the vessel by the user who prepares or causes to be prepared the design specifications. Division 3 does not establish maximum pressure limits for either Section VIII, Divisions 1 or 2, nor minimum pressure limits for this Division. Rules pertaining to the use of the UV3 Code symbol stamps are also included.